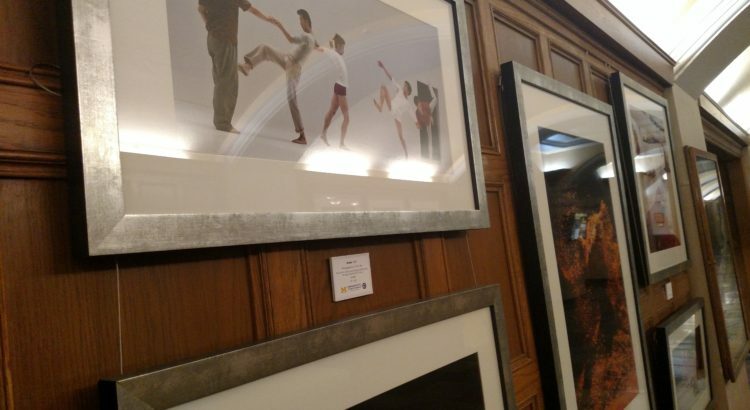 Currently hanging throughout the lobby and first floor corridor of the Michigan League for all to enjoy are works by dance photographer Yi-Chun Wu. This week, I had the privilege of seeing these photographs, which are collectively entitled East in Motion. The photographs are of a wide range of dance groups and companies in action, and each is captioned with its title, the year, and the subject. To me, the artistry and skill, both of the dancers in the photograph and of the photographer behind the camera, was very evident. Some of the photographs are crystal clear, as if the precise instant in time was frozen, while others are blurred in a way that captures the dynamic of the dancers’ motion. Some are brightly and clearly lit, while others play with the shadows of the stage lighting. The picture to right, which is one of my favorites from the exhibition, captured my attention because of the sheer fabric piece in the center of the image. Perfectly, Yi-Chun Wu managed to capture the way that the light dances on the its surface, and it leads the eye to the dancer in the lower right foreground. The grace of the dancer is also communicated, and those looking at the photograph can see the rippling movement of the material spanning the image, and sense the flow and beauty captured by the camera’s shutter. This image to the left, on the other hand, contrasts the one above in many ways. The light is brighter, and there is a clear sense of action. 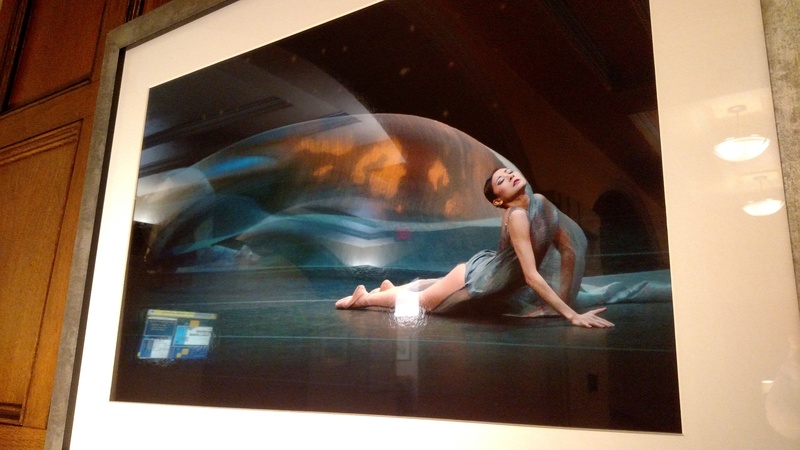 It is fascinating to see the dancer who is the subject of the image frozen in midair. 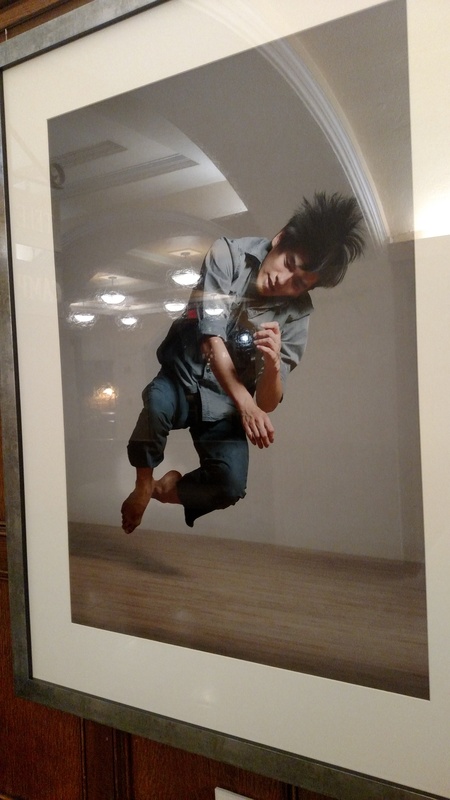 This is an example of photography capturing something that can’t be experienced with the human eye – while it is possible to see the dancer’s jump, the moment captured in Yi-Chun Wu’s photograph would go by too quickly to be noticed by an observer. The minute details, such as the shadows on the floor, or exact location and position of the dancer’s feet, the orientation of his wrists, or the turn of his head would be lost to the onward march of time, but Yi-Chun Wu selected the moment to preserve in her art. The exhibition East in Motion will be in the League through November 30, 2018, and I strongly recommend stopping in to see Yi-Chun Wu’s art for yourself! The photographs above are only a small sample of those on display, and each one will challenge you and bring you into the moment that it was captured. I walked past this exhibit multiple times. I never made the connection to how the fabric in the first piece leads our eyes towards the dancer. this progression reminds m of dance itself where the movements of the dancers leads our eyes to wherever the dancer decides. In a way the clothing is as important to the dance as the movement of the bodies.